Nicola Nanefeld 1958-ban született Londonban. Jelenleg Németországban él 3 gyermekével és az Alexander Technique iskolában tanít. A The Bach Centre akkreditált Bach-virág tanácsadója (BFRP) 1997 óta. Több, mint 30 éve hódol hobbijának, a fotózásnak, melyet fél professzionális szinten végez. A könyvben szereplő fotókat maga készítette, ahogy a történetek alapját is a saját tapasztalatai adták. Nicola 38 önéletrajzi történetet mutat be, melyen keresztül bepillantást nyerünk 25 év tanítás és 26 év Bach-virág tanácsadói munkájába. Őszintén ír arról, hogy milyen szerepet játszottak életében a Bach-virágeszenciák. Történeteiben megosztja az olvasókkal a tapasztalatait, miközben őszintén visszatekint saját életútjára. A történetek néha meghatóak, néha viccesek, máskor meg épp szomorúak. Mindegyik fejezetet az eszencia bemutatásával zárja, melyben bemutatja a növénytani jellemzőket is. mérete: 21 x 15 x 2 cm. We often advise people who are studying the Bach flower remedies to keep a track of their emotions. Keep a remedy journal, we say, and note down how you feel about the situations you encounter. Journaling helps us learn the remedies because we see how they relate to our lives. It also helps us learn about ourselves and our feelings. The best journals are always about humanity, and about growth. In contrast, an occupational hazard threatens people who write more formally about the remedies. It occurs when we focus so hard on the system, on remedy indications and dosage and so on, that we forget to put any people in. This is especially strange because the whole focus of Edward Bach’s work was people – their personalities, their feelings, their emotions. Humanity is central to the remedies. That, in a nutshell, is why this book is special. More than a book about remedies, this is a book about people. Using her own life and experiences as a framework, Nicola Hanefeld introduces us to those fundamental feelings and personalities that are the basis of Dr Bach’s system. She tells us about her life, her faults, her qualities, her relationships. The stories are human, sometimes wry, always engaging. Some will move you; some – I’m thinking about the tale of how Nicola came to own a Cerato plant – are gentle and funny. The decorating story made this reader laugh out loud. This book teaches the remedies because it’s all about life. That’s putting things in the right order. Sommer 2004: Although I had been using the remedies for about 18 years there were still a few remedy plants that I had never encountered growing freely. Cerato is one of them and this strange story began with a difficult personal situation I experienced in July 2004 when I needed a lawyer. She was competent and well recognised but quite a hard liner and was fighting (as I had indeed asked her to do) for my rights. I felt myself to be in good hands and trusted her judgment and approach to the situation – it appeared to me as the right and correct strategy. However, I started sleeping badly. Some disquiet was obviously gnawing at me. In the middle of one night whilst neither really asleep nor properly awake, I got up and walked trance-like to my remedy box. Without looking, I took two drops pure on my tongue of the first remedy that I had touched in the darkness. Back in bed I immediately fell into a deep sleep. I awoke refreshed, something I had not experienced for several weeks. My first activity was to contact my lawyer and ask her to change her policy to a milder one which meant losing my cause and stopping “fighting”. I did this without making a conscious decision to act. Afterwards, I reflected and then suddenly remembered that I had taken a remedy in the night. I walked to my box and was surprised to see that it had been Cerato, a remedy that I very seldom take. There it was standing alone, outside the box. However, as I was feeling clear and peaceful, I interpreted the decision to change course as coming from a deeper part of myself that Cerato had brought to the fore. I slept much better as a consequence in the following weeks. The 7th International Alexander Technique Congress was being held in Oxford and I went to England for it. Prior to this, I visited the village where I grew up for a couple of days. I am somewhat short sighted but do not always wear my glasses. While I was out for a walk one afternoon, I saw or rather “felt” a blur of spectacular deep blueness a few feet to my left in front of me. Enchanted, I approached the plant bordering the road from someone’s garden and recognised it as being Cerato. I enthusiastically greeted the plant (I love talking to plants) and drew in the impressions of the delicate petals, the deep saturated blueness and touched the surprisingly rough leaves and wiry, wooden stems. Two days later, now in Oxford, I encountered Cerato again where I was having lunch. A whole border was covered with vibrant and beautiful masses of Cerato that seemed almost to glow from within. 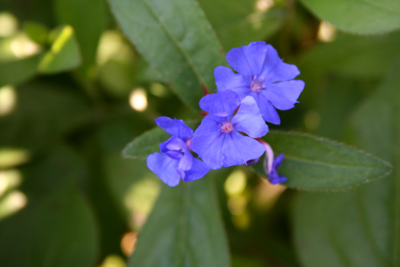 A lush carpet of dark, softly shining leaves surrounded the beautiful cobalt-blue flowers. I could hardly believe that I had never met this plant previously. On the same evening I met the plant yet again in the garden of the house where I was spending the night in Oxford. I suddenly spotted a low growing small Cerato plant and commented on it to my surprised hostess. As she had only brought it and planted it on the previous day she could not understand that I had even noticed it. The brilliant sky-blue flowers in the late summer light had captivated my attention. I explained why the plant was special to me and also told her that the elegant Cerato is Tibetan-endemic. A couple of days later, being not far from Sotwell I took a trip the the Bach Centre and – you´ve guessed already – Cerato was there yet again, this time hardly surprising at Dr. Bach´s home. In September, back in Germany, I knew now that I had to have my own personal Cerato plant – but where to find one? Journeying around garden centres did not appeal to me, above all without knowing before hand if they even had it in stock. I need not have worried; as I went shopping at my local supermarket for the first time following my return, my eyes fell on a small, solitary (and decidedly feeble looking) Cerato plant on the floor upon entering the supermarket. It was labelled an “Autumn special offer” and was priced at 2,22 Euros. I stood there a little bemused. Then smiling, I bought it and left quickly. Back home I had a good chat with the plant and gave it some of the rescue remedy. Within 3 days I was rewarded by dozens of the electric blue flowers vivid against leaves now tinged red.Autumn was approaching. Since then I have kept Cerato on my balcony and make it a habit to take it now and again to support my own listening to that quite inner voice, always remembering the strange series of events that led me to getting acquainted with the plant. Many years ago I was acquainted with someone with a Cerato-Scleranthus personality. She would place problems at my feet and it was as if I should decide what she should do. As I did not involve myself in solving her problems, it remained a superficial encounter. Ceratostigma willmottiana, also known as Chinese Plumbago is named after Ellen Ann Willmott (19 August 1858 – 27 September 1934) an English horticulturist who cultivated more than 100 000 plants. 60 species of plants are named after her. As it received her name, we may speculate that Cerato was discovered by her and that she also introduced it to the western world. It is native to western China and Tibet but is now frequently found in gardens in Europe. It is planted these days as a much valued ornamental but very hardy deciduous shrub with rich blue flowers that come out in late summer / early autumn when the leaves start to turn from green to red. The stems become woody as it grows in age but it dies back in winter to ground level, almost disappearing during the cold season only to reappear in late spring. The attractive flowers are presumably pollinated by insects in its native habitat. I have never discovered any seeds on my Cerato plant; it reproduces vegetatively underground, new sub-plants (clones) springing up a few centimetres away from the original plant. Botanically seen, it is related to the carnations, but also cacti and many carnivorous plants. Cerato is revered as a symbol of wisdom in Tibet. Cerato was the only cultivated plant chosen by Dr. Bach. He first prepared it near Cromer, Norfolk in 1932 using the sun method. Az angol The Bach Centre regisztrál Bach-virág konzulense (BFRP) vagyok. Az eszenciák 2007 óta töltik ki a mindennapjaimat. Munkám egyben a hobbim is. Célom, hogy minél többen megismerjek Bach doktor csodás rendszerét, mely szelíden átsegít minket a hétköznapok nehézségein.